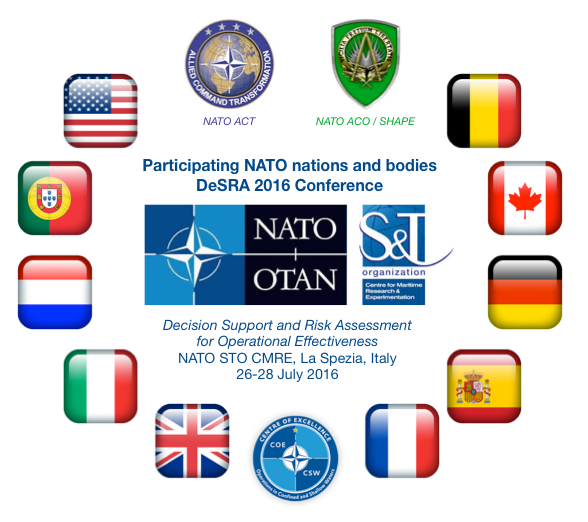 As of August 1st, 2016, the NATO nations, bodies and institutions/organizations participating in the DeSRA 2016 Conference has been published. A comprehensive list containing all them can be found in the "Participants" section. As of July 19th, 2016, registration is closed. REGISTRATION for accepted Abstracts and Summaries of Intent for Participation is ALREADY OPEN. Go to the "Abstract Submission & Registration" section and follow the steps given there to be registered. Registration closes on July 18th, 2016. More details on the "Participants" section. Abstract submission deadline: June 19th, 2016, at 23:59 (Local time, Italy). Abstract submission under the "Abstract Submission & Registration" section. Physical factors, such as the meteorological and oceanographic (METOC) conditions, that determine when and where resources/assets can efficiently run operations. Social/economical/political factors, such as the border activity, ecological and industrial pressure, amount of vessel traffic or fishing activity through an area of interest, that constrain how resources/assets can efficiently run operations. NATO STO CMRE is hosting the DeSRA 2016 Conference to discuss these factors and their impact on civilian and military operations and infrastructures, in ports and near-shore (shallow waters) or at open sea/ocean (deep waters). These impacts could be described through Risk Analysis and included in the Decision-Making process along with other relevant criteria for mission optimization. For this purpose, the DeSRA 2016 Conference will bring together scientists, operators and subject matter experts (SMEs) on scientific and operational topics such as environmental prediction and risk analysis/assessment strategies, which would potentially lead to inputs into the NATO Recognized Environmental Picture (REP), Environmental Functional Services (EnvFS) and other potential Decision Support frameworks. Topic discussions will include information representation, visualization and communication, and approaches for validation and verification (V&V) of the proposed solutions. Military and civilian personnel, researchers and industry developers working on any of these areas or related fields are welcome to participate. The overarching objective of the DeSRA 2016 Conference is to bring together military and civilian personnel, industry and research communities to discuss and identify environmental risks, planning shortfalls and ways-ahead to assist decision makers and improve operational effectiveness. Researchers and industry will be exposed to real challenges faced in operations. Military and civilian personnel will learn about state-of-the-art techniques and systems on the topics of the conference and have the opportunity to influence their development. Recognized Environmental Picture (REP). NATO recently approved the REP concept. This conference aims to present and discuss the ambitions of this new framework, identify major shortfalls and outline possible joint collaborations. Information representation, visualization and communication. Collection and fusion of information will be critical to create an accurate REP. This conference will also discuss different ways information is presented and communicated (visually, textually, etc.) to the final users in order to produce operational impact. Environmental prediction and risk analysis/assessment strategies. New environmental analysis and prediction systems assume the environment as a stochastic domain where variables are treated as probability distributions. This conference aims to present these new approaches and how they change the paradigm of environmental forecasting to produce a risk analysis where impacts and environmental pictures are weighted against their probability of occurrence. Decision Support and NATO Environmental Functional Services (EnvFS). Well-informed decision-making requires integrating risks and operational constraints. This conference aims to identify shortcomings of current decision support systems and the ways-ahead for the new NATO EnvFS. Approaches for validation and verification (V&V). V&V is crucial to produce credibility of the final solutions and allow end-users to engage into new developments. In this conference participants will learn about current V&V approaches at sea or in coastal areas for validating and verifying forecasts, risk assessment and decision support systems, as well as V&V of operational systems. The DeSRA 2016 Conference will be a forum for discussion about key aspects of decision support and risk assessment/analysis. The main output of the conference will be a CMRE report and contributions will be made available on-line through the password protected CMRE GEOS-Server. The expected outcome will be a strategy to define the way-ahead on the REP and feedbacks to the research community so that they can fine-tune research programs to better support NATO Environmental Services in the medium term. 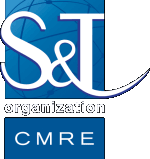 These can include exploitation of Joint Research Projects with participants, and to develop consortia for future research projects, for example, EU H2020, national program project calls, and/or multi-national NATO projects. Attend and contribute: by providing a short abstract (no more than 200 words) and giving a short presentation (10 minutes) about one of the stated objectives/topics of the conference, and providing a summary of intent for participation (background and expected outcome). Only attend: by providing a summary of intent for participation (background and expected outcome). Abstracts will appear on-line on the DeSRA 2016 Conference web site and will form part of a CMRE report on this conference (unless specified the opposite). Attendance is limited to the nationals of the 28 member countries of NATO, as well as Australia, Austria, Finland, New Zealand, Sweden and Switzerland. The meeting will be held at NATO UNCLASSIFIED security level. The number of participants is limited. Participation will be confirmed once an abstract and/or a summary of intent has been submitted and accepted. Registration and participation have no fee.